Are you looking for a fine selection of apps to help in securing your home? That's great, because Mr. James McCann, Director of UK CCTV equipment supplier JMC Technologies, beamed us this handy infographic that he created. It's about ten of the best free home security apps available on Android and iOS. They connect to security cameras to provide live streaming and store data (pictures and video) in the cloud. Some support live two-way voice audio or let you arm and disarm your security panel remotely. Others offer physical control, multiple channels of live view display, scheduled recordings, encrypted connections, integration with mail and social media accounts, as well as many other extras. That aside, these apps will let you keep a watchful eye over your property from any connected place in the world, providing instant alerts whenever unusual activity is detected. 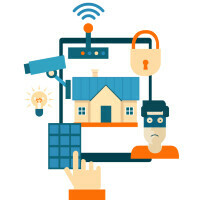 The plethora of home security applications makes it remarkably easy to watch over your property and prized possessions. What's even better is that most of these apps are free! So check out the awesome infographic in the slideshow below. We've included download links to the Android and iOS versions of the apps to ease you in. I like the Alfred app... You should check it out. I was just going to recommend that. I have a $10 Boost Mobile Kyocera Hydro in my front window of my home so I can see everyone who comes and goes around my front door. So far it works great! I wish there was someway I could pay the company who makes Alfred. I haven't tried it, but it says that there are in-app purchases for Alfred? I have presence and have liked it, but lately it keeps saying my camera at home is offline. I've rebooted the phone at home and check it and all seems fine.